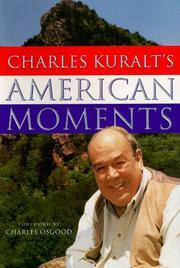 An illustrated anthology of —American moments— from the late newsman and wanderer Kuralt (A Life on the Road, 1990; On the Road with Charles Kuralt, 1985). Famous for his —On the Road— broadcasts on CBS, Kuralt transformed himself from a run-of-the-mill network reporter into a kind of latter-day (and, admittedly, much straighter) Jack Kerouac by crisscrossing the country time and again in search of nothing more than something to think about. Although his broadcasts started out as pretty standard human-interest stuff (the man who built a road to nowhere, etc. ), he became more and more attentive, as the years passed, to the (often-endangered) shapes and rhythms of ordinary life: the general store, the small-town diner, the open-air market in Seattle, and the old-fashioned tailor in Chicago. This is a collection of his last broadcasts, all of them short, impressionistic, and evocative, all of them together forming a cumulative picture of American life in the 20th century. Just as hokey and sentimental as Kuralt’s broadcasts, they will appeal to his many fans but won—t win many converts among the unbelievers.